Johannes introduced the exhibition as a research between inside and outside worlds and boundaries. Then individual presentations were given by Johannes Frauenschuh, Mauricio Suarez and Jasmina Grudnik. 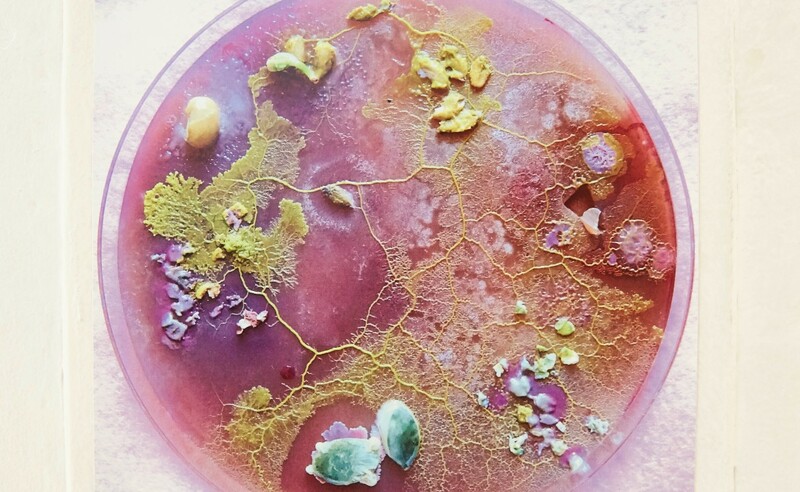 Johannes exhibited a mixture of paintings, everyday objects and photographs of slime molds he made. Paintings were made on paper and textile material. Drawing on Karl Marx’s critique of (pan)capitalistic system, Johannes illustrates the salability of everything, linking the slide mold’s fractal architecture with the spread of data in the digital era. Commenting on the role of global social media companies such as Google or Facebook, located in the birthplace of the hippie movement and the personal computing, he asks question regarding the effect of such technologies on the individual.